In the early hours of the morning, Mrs M queued for tickets for the Kabukiza theatre in the Ginza district. Queuing attendants sorted patrons into various lines handing out sheets of instructions for non-Japanese speakers. With ticket in hand for two acts in the late morning Kabuki performance, she walked to the Tsukiji fish market and snacked on barbecued smoked eel and green tea. Back at the theatre, Mrs M’s headset talked her though the story of woman who had an encounter with what appeared to be a pantomime horse in the first act. The second act described how two fishermen had discovered a statue of Kannon Bodhisattva, Goddess of Mercy in their nets which they took to the village elder, who subsequently founded the Sensoji temple around the golden statue. It was all very complicated - a dragon was also involved somewhere in the story. In the evening, we dined at the Brasserie Saint Martin which serves decent basic French dishes. Mrs M selected a rather fine pork belly on puy lentils while I went for a more rustic saucisse-frites. 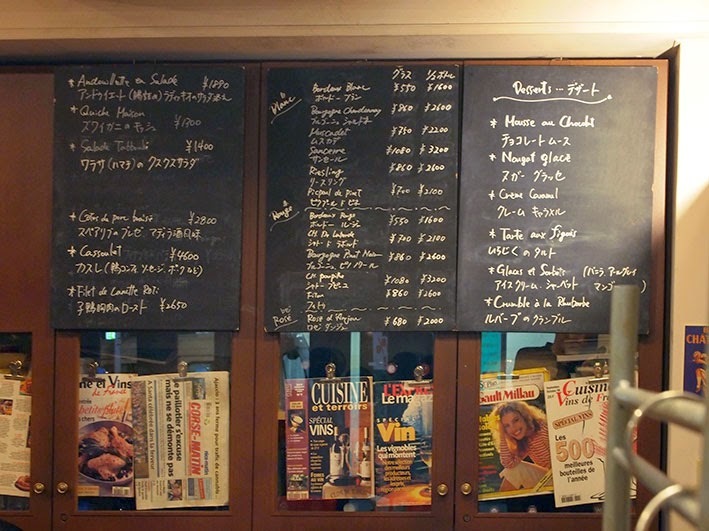 The blackboard of specials included a splendid example of Japanese-French-British confusion cooking, ‘Crumble à la Rhubarbe’, written in Japanese as ルバーブクランブル.